IBM® Systems Director is a platform management foundation that streamlines the way that physical and virtual systems are managed. Using industry standards, IBM Systems Director supports multiple operating systems and virtualization technologies. 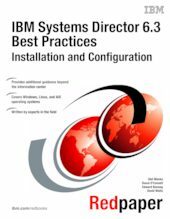 This paper provides guidance and preferred practices about how to install and configure IBM Systems Director Version 6.3. Also, installation guidance, fundamental topics, such as discovery and inventory, and more advanced topics, such as troubleshooting and automation, are covered. This paper is meant to be a partner to the comprehensive documentation in the IBM Systems Director Information Center. This paper is aimed at IT specialists who are planning to install and configure IBM Systems Director on Microsoft Windows, Linux, or IBM AIX®.